True Optimum 254nm High Output UV-C Low Pressure, Hot Cathode Quartz Germicidal Bulb/Lamps; 4 TIMES the UVC output of those typically sold by discounters! For 5 through 55 Watt Sterilizers/Clarifiers; PLL (G11, G7, G24) and PLS (G23 & GX23), low-pressure hot cathode germicidal (254-265 nm) ultraviolet UVC lamps. Be assured that when you buy from us, you are buying from someone with over 30 years of UV Sterilization expertise, not a second party seller with questionable product knowledge/quality or customer service! 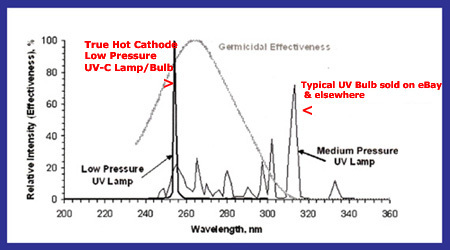 These are NOT the "LOW-END" Medium Pressure UV Lamps (often with as 7% UVC or in other words 76% less UVC output) sold elsewhere at prices less than the cost to produce the Hot Cathode, Low Pressure Mercury, Highest Output Germicidal UVC Lamps/Bulbs we sell!!! So when you purchase a 9 watt UV replacement bulb via eBay/Amazon for $10 or less, you just reduced the output of your UV device by 75%, making it a pretty blue clarification at best device!! 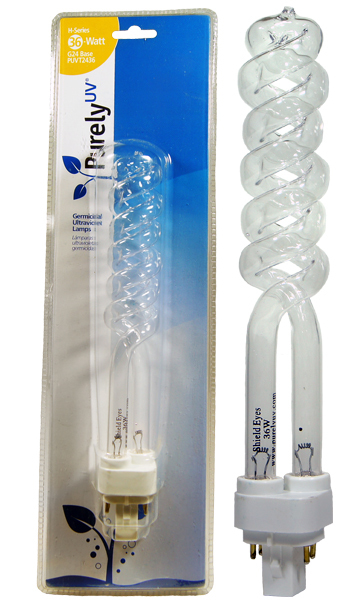 Lowest Prices for first quality TRUE Level One capable non-ozone producing Quartz UV bulbs! 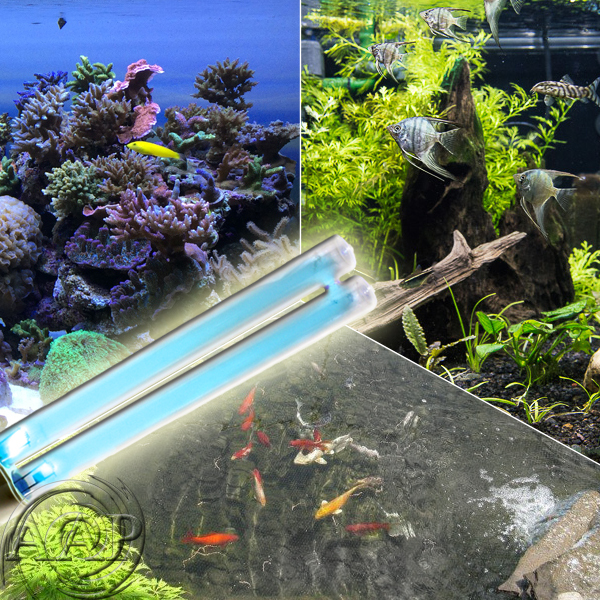 *All lamps are rated at 8000 hours, but should be changed every six months for aquariums or 6-12 months for ponds (depending upon climate). *Please check your base that to verify the basic types; G7, G11, G23, GX23. G24. *Please click on pictures below to enlarge for a better view. We list replacement UVC Lamps/Bulbs in order of wattage, lowest to highest. •	Pin space = 7/8" (2 cm) Approx. •	The 5 watt G23 base fits Terminator, Via Aqua Multi Skimmer, Tetra UV5, GreenFree™ UV Mini Pond Clarifier, Tetratec #25075 UV5, Cyprio Vorton 500, Cyprio Bioforce 250 & 500, JBJ Submariner, Aqua Medic Helix Max 5, TMC Clear Stream 600 Filter with UV, Via Aqua Pond Filter EF-3000UCV, FishMate 500 Pressurized UV, Oceanic BioCube Mini 5w UV, UniMax Pro 150, and many more. •	The 7 watt G23 base fits AAP/SunSun Terminator, ReSun 7 Watt UV, Alpine, Garden Treasures Pressurized Filter #60028, Sunterra Pressurized Bio-Filter, and many more. •	TRUE Low Pressure UV Bulb, unlike many now sold that discount sellers might state they are but even the price states otherwise since cost is more than they sell these for. An example would be eBay seller "Discount Aquatic" which has without permission, cut and pasted our information on their eBay selling page. A view of the UV Bulb they sell clearly shows it is NOT the same as ours, but the information implies it is the same. •	The 11 watt G23 base fits Jebo and more (please note that many newer Jebo require a proprietary 11 Watt Bulb that is shorter in length than the industry standard 11 watt UVC bulbs we sell, consider using the 9 watt G23 or the 13 Watt G23 which will work in these units and are the same overall dimensions). •	The 12 watt G23 base fits Garden Treasures Pressurized Filter and more that require a 12 watt UV bulb. •	Pin space = 7/8" (2.2 cm) Approx. •	The 13 Watt G23 base fits Via Aqua Terminator (the Only 13 Watt UVC lamp that fits the Terminator), AAP/SunSun CUP-613, AquaTop UVCP-13 UV Pump/Filter, Aqua Top PFS 300 Pond Filter, AquaTop Submersible Pond UV Sterilizer UVFK-9, SunSun CPF-250 & CPF-280 Pond Filter (newer models), JBJ Submariner, Jebo, PondMAX Ultra PF2400UV, PEAK UV PCO Air Purifier, Cyprio Bio Force 2000/4000 (models requiring G23 base), Cyprio Vorton 2000/6000 (models requiring G23 base), Fishmate 3000 & 6000 (older models requiring G23 base, please check your base to make sure your UV does not require the newer GX23 below) and more. •	GX23 Base that fits new proprietary UV Sterilizers that require a 2 clip base instead of the standard 1 clip G23 base (GX =2 clips). Newer Cyprio UVs (such as the Hozelock Bioforce™ 2000 UVC 1314 & 4000 UVC 1335), Ecoclear™ 2000 UVC 1314 & 1328, Ecoclear™ 4000 UVC 1329, the Newer Fish Mate 3000 and others. 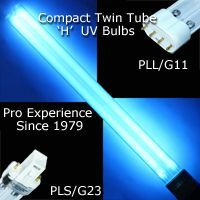 Please note that the GX23 (PUVX213) 13 Watt does not fit the Terminator, AquaTop, & Submariner UV as well as many older versions of popular 13 Watt Sterilizers/Purifiers, despite some inaccurate online guides that state otherwise, so please check your UV lamp first (these all require the G23/PLS 13)! This is a PREMIUM Norman Lamps G11 UVC Lamp with the HIGHEST Output of UVC compared to other cold cathode UVC lamps sold elsewhere for $12.50 and less! •	The 18 watt a standard four pin base that fits: some Tetra PUV 2500 & 4000 (some models require shorter bulb below, so please check length), AAP/SunSun Terminator, Anjon, Garden Treasures (Lowes), Coralife Turbo-Twist 6X, Jebo, Terminator, Aqua Medic Helix Max 18, Custom SeaLife 18x Double Helix UV Sterilizer, Cal Pump Biofilter #BF2000 & UV18 (2006 or older), CaluTech Mini Air Purifier, Honeywell Airvent Air Treatment System, ReSun 18 Watt, Sunterra Pond UV Clarifier #334018 and more. •	Similar to the other 18 watt lamps, just shorter. •	The 24 watt a standard four pin base that fits OASE Bitron 24C UVC Clarifiers, Fish Mate Pressurized 6000, Green Killing Machine 24, Terminator, Jebo 24 Watt, and more. •	The 36 watt is a standard four pin base that fits Tetra GreenFree UV Clarifier – UV3, AAP/SunSun Terminator, Anjon, Jebo, Coralife Turbo Twist 12X, Cal Pumps (older Units), CaluTech Original "Blue" Air Purifier, Aqua Medic Helix Max 36, Fish Mate Pressurized 9000, Oase Bitron 36 Clarifier, Bitron 72 Clarifier, York S1-UV50120 Hybrid UVC Air Purifier, Honeywell UC36W1006 Enviracaire, and more. •	This UV Replacement lamp as of Late 2015 includes Norman lamps high efficiency, low heat/HO technology!! •	The 55 watt is a standard four pin base that fits Anjon, Aqua Medic Helix Max 55, Jebo, Oase 8000 & Bitron 55 Clarifier, Bitron 110 Clarifier, Calutech Blueray Super Output UV Air Purifier, and more.